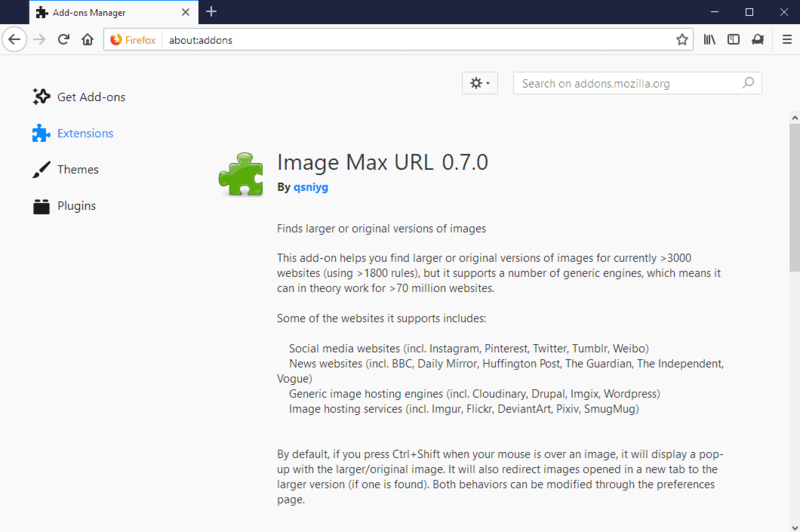 Image Max URL is a browser extension for Firefox and a userscript designed to provide users with an option to load larger versions of images that they encounter on the Internet. Images displayed on websites are not necessarily displayed in the largest resolution that is available. Some sites pick the right version of an image based on factors such as the resolution of the browser window to deliver the best image based on that. Smaller images have several advantages such as a smaller file size when compared to original images; this improves the loading time of the site and decreases bandwidth costs at the same time. The disadvantage of displaying smaller images on websites is that they may not provide as much detail as the full copies. Some Internet users may want to look at full resolution images as they may provide more detail or download these larger versions of images for safekeeping or use as desktop wallpapers. Image Max URL started out as a userscript that users could load in the web browser to add the provided functionality to the browser. The extension is also available as a Firefox add-on. The add-on does not support image previews. The add-on supports automatic redirects (for custom header images or images that are set to download). Both tools work identically in all other aspects. The userscript requires installation of a third-party extension that adds userscript support to the browser. Advantage here is that this works in Firefox, Chrome, Opera, Vivaldi and other browsers. Image Max URL replaces image URLs with different ones to retrieve larger versions of images if available. It features more than 3000 hardcoded URL patterns and API calls for sites like Twitter, Pinterest, Tumblr, Weibo, Flickr, or Imgur, and generic engines support next to that. Hover the mouse cursor over the image that you want to retrieve a larger copy of. Use Ctrl-key and Shift-key to load the larger image (if it exists). You can change the default keyboard shortcut Ctrl-Shift to another one in the options. The extension supports a combination of Ctrl, Shift, and Alt, and may delay the operation by one or three seconds. It may take a moment before the image is displayed depending on the speed of the Internet connection and size of image. The detected image is displayed as a popup on the screen and you may interact with it directly. A left-click loads it in a new tab, a right-click displays options to save it or process it in other ways. As far as options are concerned, there are a couple more. Image Max URL does not load watermarked images by default and ignores smaller non-watermarked images. It happens that similar sized or even smaller images are returned by the extension. This may happen when no larger version of the image is available, when URL Image Max failed to detect the larger version, or when a site scales images automatically. Image Max URL is a useful extension for Firefox and userscript for all browsers that support scripts. While you need to test its functionality to see if it works on sites that you visit regularly, it is useful to users who want to look at larger copies of images regularly or download these to their devices. Now You: How do you handle small images on sites? Right click —> View image. If there’s a larger pix available you’ll see the magnifier. That is only true if the image is linked. This extension and script takes care of sites where this is not necessarily the case. How do I handle small images on sites? I’ll zoom the page most often which will bring up a lousy pic or use a magnifying glass. In the latter case I have a great success at making anyone around the screen develop an outstanding laugh. Way back I got a book sized fresnel lens for something, don’t remember why. Try one of those for a laugh! It’s actually the same case for Image Max URL as well. Unfortunately it’s the only way either extension can actually work, as it needs to be able to read the images on the page in order to do the popup (and this requires a content script, which can access anything on the page). Redirection doesn’t necessarily need a content script (although IMU uses one for redirection as well, due both simplicity and its roots as a userscript), but even if it worked purely as a background script, I believe it would still require those permissions, as it would need to check every URL to see if it can be redirected (which, as far as I’m aware, will also always include the headers). However, both Hover Zoom (repo linked by justakiwi) and Image Max URL (https://github.com/qsniyg/maxurl) are open source, so you can look through the source code. Although IMU’s source code is relatively large (~23k lines of code), you can just search for “do_request”, which is where HTTP requests are done. The addon also intercepts requests done by the content script in extension/background.js, in order to change certain headers for the request to work properly. Yes, I understand what you said, but don’t like the idea that an app can read the login username and password for my banking site for example. It raises all sorts of questions as to the security of the data which has been retrieved. I am using https://tineye.com/extensions in Firefox and New Moon (classic extension, don’t know whether it has a webextension version) , which generally works fine. Launch via context menu. You can sort its results list, like to show biggest ones first. You can search I believe up to 100 images per day for free, each day again. TinEye is indeed an interesting Firefox extension but it’ll require a search for an an image’s larger dimensions’ availability you won’t have t right on the screen as with the exxtension/script mentioned in the article.